KHAN YOUNIS, Gaza Strip (AP) — Thousands of Gazans on Saturday thronged the funerals of seven people killed by Israeli troops during mass protests the previous day, chanting anti-Israel and anti-U.S. slogans and calling for revenge. The coastal strip’s ruling Hamas militant group, meanwhile, dispatched a delegation to Egypt in a desperate new attempt to ease a crippling blockade on the Palestinian territory. Friday’s violence was the deadliest day of protests in nearly four months. Among the dead was an 11-year-old boy, believed to be the youngest of 144 Palestinians killed by Israeli fire during the protests. Another boy, a 14-year-old, was also among the seven killed. The Hamas-orchestrated protests were launched last March in large part to press for an end to the blockade, imposed by Israel and Egypt after the Islamic militant group took control of Gaza in 2007. The blockade has ravaged Gaza’s economy, and with Egyptian-mediated cease-fire efforts deadlocked, Hamas has vowed to step up the protests. Israel, which has fought three wars against Hamas, accuses the group of exploiting and endangering civilians by using the protests as cover for militant actions. Responding to calls by Hamas, thousands of Gazans participated in Friday’s protests, burning tires and using the billowing thick smoke as a screen to hurl rocks and firebombs toward Israeli forces on the other side of the fence. At one location in east Gaza City, where four of the seven were killed, hundreds of protesters breached the fence. Amateur videos showed them kneeling down and kissing the ground on the Israeli side as gunfire could be heard. Others posed on the fence, urging protesters to follow. The protesters were seen cutting through the fence and damaging it. It’s unclear how long they managed to stay on the Israeli side of the fence. The Israeli army said the protesters damaged security infrastructure and threw more than 100 explosives. No soldiers were hurt. 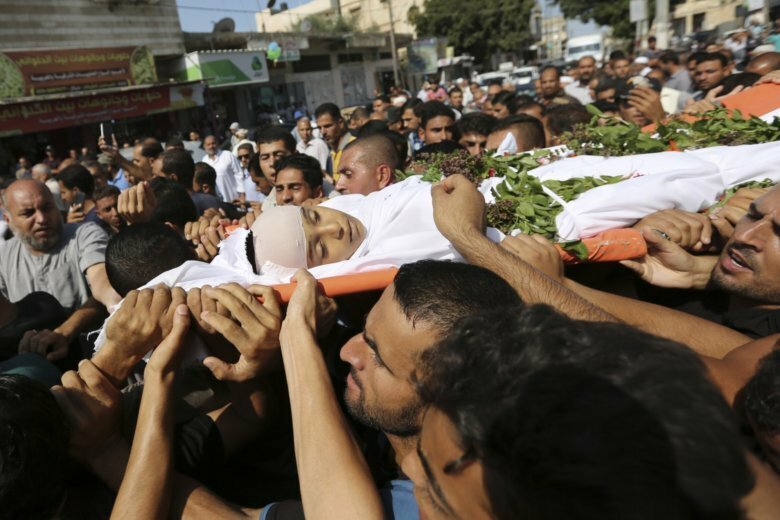 The Palestinian Health Ministry reported 90 people were wounded by live fire, and seven killed. About 1,000 mourners attended the funeral of the 11-year-old victim, Nasser Musabeh, whose body was wrapped in a white shroud and carried on an orange stretcher. In an ancient Islamic custom, bundles of basil were thrown on the coffin. Nasser was the brother of Duaa Musabeh, an 18-year-old volunteer paramedic who attends the weekly protests in the southern town of Khan Younis to treat the wounded. She said she would take her brother with her each week, ordering him to stay back in a safer space, about 300 meters (yards) from the fence where crowds typically gather. Believing he was in a safe area, she approached the fence to help evacuate wounded protesters. But when she returned after dark, her brother was missing. As she frantically searched for him, a man showed her a picture of a dead boy released by a nearby hospital that was trying to identify him. Nasser had been shot in the head. “I did not believe it. I felt unable to move an inch, I fell on the ground,” she murmured slowly. According to al-Mezan, a Gaza-based human rights group, Nasser is the youngest person killed by Israeli army gunfire in the protests. Another 11-year-old boy was killed earlier this month under unclear circumstances, by a blunt object. Israel says it is defending its border and in a statement, accused Hamas of exploiting and endangering children by sending them to the fence “as a cover for terror activity.” The military released videos showing protesters hurling flaming tires and cutting the border fence with wire cutters. “Hamas is responsible for the violence riots and their consequences,” the army said. But Israel has come under heavy international criticism for what many say is excessive use of force and the high death toll among unarmed protesters. The top U.N. humanitarian official in the region, Jamie McGoldrick, said Saturday that he was “deeply saddened” by the loss of life, urging both sides to ensure children are not the target of violence or put at risk. The 11-year blockade has made conditions increasingly dire in Gaza. Unemployment has risen to over 50 percent, residents receive just several hours of electricity each day and with few exceptions, Gazans cannot travel abroad. Egypt, a frequent mediator between Israel and Hamas, has hosted several months of talks aimed at forging a cease-fire that would ease the blockade. But those talks appear to have made little progress, putting heavy pressure on Hamas as it deals with an increasingly frustrated public. Hamas has blamed Palestinian President Mahmoud Abbas, who governs part of the West Bank and who has demanded Hamas return control of Gaza to him, of thwarting the efforts. The deadlock also has complicated President Donald Trump’s promised Middle East peace plan. The White House has not said when it will release the plan, which has little chance of success as long as Gaza remains in turmoil. At a speech in the United Nations on Thursday, Abbas threatened more measures to force Hamas into surrendering control of Gaza. Hamas fears this may include more pay cuts to former Palestinian Authority employees in the territory and reductions in services to Gaza, making it further difficult for Hamas to rule the strip. But on Saturday, Hamas sent four senior officials to Egypt for a renewed round of discussions.